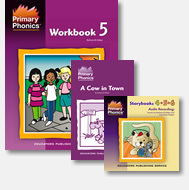 In Primary Phonics Comprehension Workbooks, students develop comprehension skills as they sequence, recognize story elements, and use context clues to build meaning. Each workbook corresponds to a set of 10 storybooks within each level. Sequencing activities provide an early introduction to comprehension skills. Questions and activities promote inferential thinking. Students are encouraged to refer back to text for information. The Thinking about Mac and Tab: Primary Phonics Comprehension workbooks introduce basic reading comprehension skills using each of the 50 original Primary Phonics storybooks. Thinking about Mac and Tab can also help teachers assess their students' reading abilities. Thinking about Mac and Tab Book 5 is the comprehension component to Primary Phonics Storybooks Set 5. This book contains early comprehension exercises designed for beginning readers. The addition of a comprehension component to workbook exercises and story reading improves the effectiveness of the Primary Phonics series and forges a closer student-text relationship while enhancing analytical skills. Exercises are included for each story in the set. Exercises include sequencing, story elements, and story recall. Follow-up activities include writing and illustration. Student Workbooks: provide extensive practice for every concept - accommodates all students, so that each student can work at the right pace with ample opportunities for reinforcement. Explicit phonics instruction with controlled vocabulary. Exercises combine both decoding and spelling instruction. MORE Workbooks: Provide additional practice and reinforce the skills developed in student workbooks 1,2 and 3. Additional practice workbooks also include Color Workbook Grade K & Consonant Workbook. Storybooks: Decodable storybooks motivate students as they apply newly learned phonics skills to engaging stories. A storybook for every concept allows student to read in context, making phonics meaningful. Students feel successful as they read books on their own from the beginning of instruction. Two additional sets of Storybooks, Sets 1 and 2A, provide additional practice and reinforce phonic concepts. Storybook Audio CDs: Model fluent reading with connected text. All 80 storybooks are read aloud, providing auditory modeling and correct pronunciation. A great tool for ELL students! 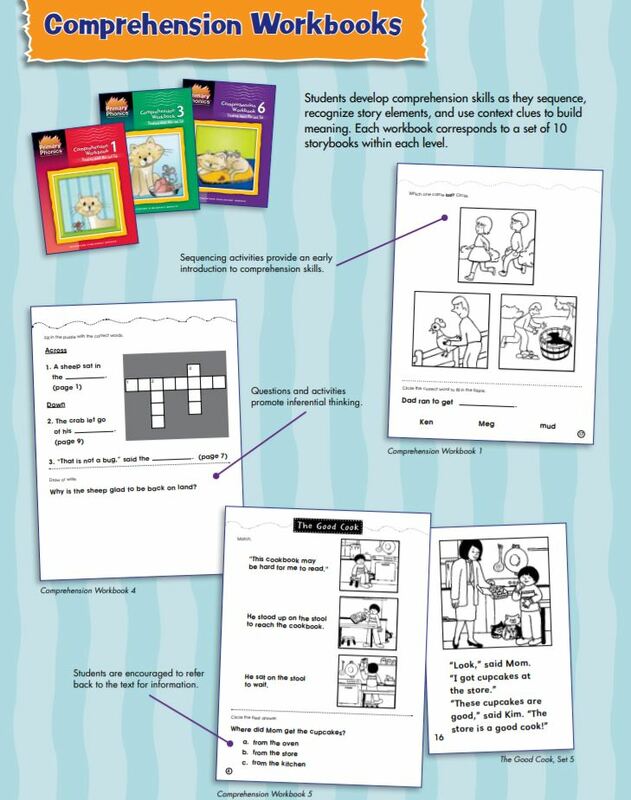 Comprehension Workbooks: Students develop comprehension skills as they sequence, recognize story elements, and use context clues to build meaning. Each workbook corresponds to story books within each level. Picture Dictionary: Beginning readers are able to match common words with corresponding pictures. Especially effective for English Language Learners. (223 pp.) Great Classroom Resource! Teacher's Guides: Detailed lesson plans include phonemic awareness, phonics, vocabulary, comprehension, fluency, and writing. Cross-references are made to student materials provide extra instruction for students who need more practice. Intervention Guides Levels 1-6: The Intervention Guide Levels 1-6 presents a reading approach designed for students with dyslexia and other learning disabilities. The Guide contains 60 lessons, corresponding to the Primary Phonics storybooks with instruction provided in three learning styles: visual, auditory, and tactile.